The Learning Pavilion follows the behavioral management philosophy of Conscious Discipline by Becky Bailey. The intent is to prevent misbehavior, rather than simply “react” to it. Instead of punishing children after they have misbehaved, the environment should be set up so that children will be less likely to misbehave. This means that certain conditions should be kept in mind: enough toys, enough space, enough activities, enough time, etc. We encourage children to control their world through language and the opportunity to make choices. The program provides a panorama of experiences from which the child can choose in order to give him/her a sense of control. The environment of The Learning Pavilion is structured so that children can make choices of play activities and materials. This ability to choose and plan gives the child power and prevents many conflicts during the school day. When young children are involved in activities that they enjoy and can pursue at their own rate, they are less likely to misbehave out of frustration. When they are praised and encouraged for their efforts, they are less likely to misbehave to get attention. When children are taught to play cooperatively, they are less likely to fight among themselves. Verbal and physical aggression is always discouraged and never modeled by staff. 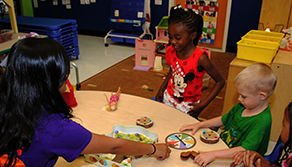 Our ultimate goal is to help the child solve problems through language and cooperation with others. In these ways, some potential problems may be anticipated and eliminated. The goal of the entire program is to support the development of an internal control system which enables the individual to grow and function within a social setting. Children are encouraged to develop language skills that help them to communicate their needs and feelings. Language is modeled for them by adults and other children so that they may learn to use language as a problem solving tool. Calm, positive, and developmentally appropriate language will be used to redirect children’s behavior when necessary to other activities, toys, or play spaces. Children may be reminded of the rules through a restating of the natural consequences of their behavior. 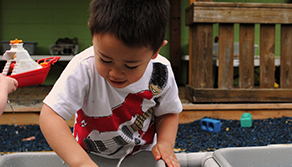 If a child is experiencing difficulty being self directed and using language to solve problems in one area of play, he/she is offered another play activity. In the event that the child is still unable to control his/her behavior and cannot make appropriate choices for him/herself, using language to get his/her needs met, he/she is removed from the problem area and given a personal space away from others. Time limits are imposed by the child. He/she may return to the group or activity whenever the behavior is under control. Children shall not be subjected to discipline that is severe, humiliating, or frightening. This includes harsh language, verbal threats of corporal or excessive punishment, name-calling, derogatory remarks, or any action that could lower the pride, dignity, or self-respect of a child. Children shall not be subjected to discipline that is associated with food. A child may not be denied meals, dessert, snacks, treats, party food, etc. Children shall not be denied rest as a form of discipline, nor subjected to discipline because they fail to rest at designated times. Children shall not be subjected to discipline that is related to toileting. 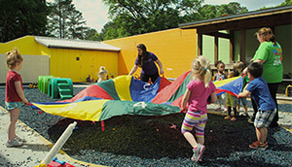 Children will not be subjected to discipline involving total isolation (i.e., “time-out”) or that denies them participation in special activities (i.e., on-site field trips, parties). Children will not be subjected to spanking or any other form of corporal punishment. This includes paddling a child, slapping a child on the hand or any other body part, pulling a child’s hair, arm, or other extremity, pinching a child or any other action that is painful or might cause a child bodily harm. The Learning Pavilion would like to provide the healthiest possible environment for the children and staff. To help us achieve that goal, the following illness policy is thoroughly implemented. All children with any signs of illness must be isolated and leave the program. Parents will be contacted immediately. Please be prepared to promptly pick up your child if he/she becomes ill at school. It is not the responsibility of The Learning Pavilion to prove illness. We are bound by the health guidelines provided by the Health Department requiring that all children who are ill or suspected to be ill leave the program. Any fever, vomiting, or diarrhea will be considered signs of an illness. Children exhibiting any of these conditions must not return to school until they are 24 hours symptom free without the aid of a fever reducer. Fever reducers will not be administered at school. We must protect ourselves and the other children from illness by strictly adhering to this policy. A note from a physician is required for a child to return to the program after being treated with antibiotics for 24 hours. If, however, our experience dictates that additional time is necessary to maintain the well-being of our children and staff, The Learning Pavilion reserves the right to delay return to the program. Our focus here at school is the social emotional and cognitive development of your child. Each child is different, and each family perceives potty training in a different light, however, there is one very important thing we need to remember—the fragile toddler ego. Helping the child to feel in control and confident during this time should be our first concern. The Learning Pavilion’s philosophy on any subject involving a child’s growth is first approached from a developmental standpoint, and second from a programmatic position. We recommend the book Toilet Training The Brazelton Way. Please do not hesitate to talk with the The Learning Pavilion Administrative Staff regarding this subject. We want this experience to be a happy one for everyone involved, especially your child. When a child displays undesirable behaviors, such as biting, The Learning Pavilion staff keep a record of the incidences. Caregivers use this information to evaluate the problem and plan a positive intervention. The intervention does not shame or punish the child, but rather teach the child how to get his needs met without using aggression. Once pertinent information has been gathered, The Learning Pavilion staff will create a behavioral plan that typically involves direct, but non-interfering supervision based on proximity of the child to the caregiver. This caregiver uses the behavioral plan to re-direct the child when conditions for the behavioral triggers are present. Over time, this re-direction to other positive behavioral outlets creates a new behavioral pattern for the child.